You are here: Home / Blog / A Fed Bear is a Dead Bear! Over decades, we Americans, have—in our minds—turned wild bears into Teddy bears, Smokey Bear, and dozens of other warm and cuddly symbols. Who among us does not reach for a stuffed, furry bear on a store shelf and feel like hugging it to us? In gift stores in West Yellowstone, Montana, and many other places in our country, cutesy figurines of bears tumbling and playing wait on shelves. Unrealistic bears appear in artwork, on placemats and napkins, as lamp bases, salt and pepper shakers, and even jewelry. In The Homeroom in West Yellowstone, (where Lee and I worked for a summer) we sold dozens of sets of dominoes nestled in a canoe supposedly manned by two adorable bears. The store—and many others on West Yellowstone’s streets—had displays of bear nativity sets. Indeed, I liked these things—enjoyed showing them to customers—even thought about bringing some home to sit on my shelves and tables. However, these items and souvenirs to not relate to the wild bears we observed living in national parks. Once in Yellowstone’s early days as a national park, feeding the bears was considered the ultimate “thing” to do on a visit. Pictures abound of park visitors extending arms and hands out car windows to offer a bear on its hind legs a special treat. No one then knew that when summer guests went home and the snow fell, a bear might starve to death. The summer snacks had not prepared the bear’s body for winter’s hibernation. 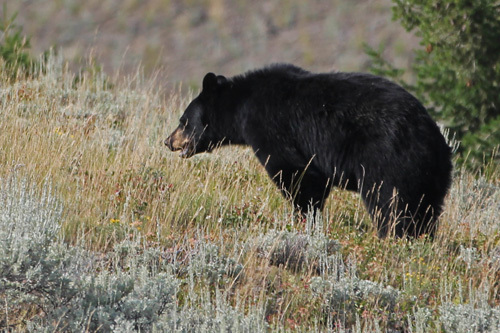 Today, park rangers warn us that once a bear—a grizzly or a black bear—tastes seasoned human food, that animal never returns to his or her berries, fish, and other natural foods that are foraged. 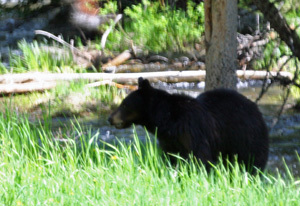 In our national parks, trash receptacles are constructed so that bears cannot open them. In fact, within the town of West Yellowstone—and many other western towns—dumpsters and trash cans have “bear proof” lids. 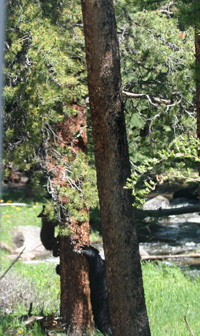 Yellowstone is home to an estimated 500-600 black bears, which are considerably smaller than the grizzly and can climb trees. Black bears can be many colors ranging from cinnamon to black to blue-gray or blue-black, brown, or even (very rarely) white. All bears are wild animals. They are dangerous creatures to respect and give space. And definitely, we must spare them our human food. In the old Train Station in West Yellowstone, pictures are exhibited on one wall of cartoon-like images of bears dressed in costumes, welcoming trains, leading parades, and intermingling with people. Yes, those images are delightful—fun to see. They produce warm fuzzy emotions. A century ago, visitors to Yellowstone believed they were making friends with the bears. Bears are not friends! They are remarkable creatures with distinctive habits and instincts. But they are not our pet dogs or cats—not animals that we befriend, pet, and cuddle. Grizzly bears live in numbers greater than black bears in Yellowstone. The grizzlies are protected under the Endangered Species Act as a threatened species. 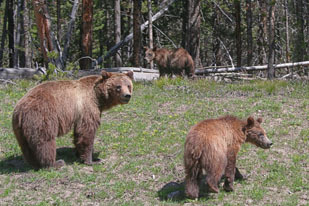 The Greater Yellowstone Ecosystem and Glacier National Park are home to the majority of the approximately 1200 wild grizzlies in the lower 48 states. These larger bears are not as common across America. While Yellowstone is home to several hundred black bears, they also reside in other parts of our nation, including in and around my hometown of Heber Springs in Arkansas. We do not often see them, but recently two bears—a black and a cinnamon—were sighted on opposite sides of town on the same day. I only saw a photo of the black one trying to get into a dumpster at our local library. He looked like a juvenile to me—probably a two-year-old. However, a neighbor who came face to face with him described him as big as a grizzly! In fact, black bears are North America’s most familiar and common bears. They typically live in forests and are excellent tree climbers, but are also found in mountains and swamps. The animals have a heightened sense of smell, trusting their noses to find food and also to spot danger. When a mother bear sniffs the wind and discerns a possible threat, she snorts and her cubs instinctively climb high into a tree. They are good swimmers, and often plunge into a stream to avoid risks with predators, especially swarming bees. Their paws are large and strong and help them to dig up roots and reeds as part of their diets. All bears are opportunistic eaters. A recent video viral on YouTube shows a black bear in Florida taking a nap on a residential lawn after he had polished off 20 pounds of dog food he found in a garbage can. Friends who returned from a vacation to Yellowstone related that a Mama Grizzly dragged a bison felled by a vehicle off the roadway. She and her two cubs feasted on the carcass for two days. Of course, the bison flesh is a natural food for the bears. Processed dog food likely gave that Florida bear a craving that can no longer be satisfied with foraged food. Excellent and informative article. But…I’m not giving up my nice soft teddy bear that keeps me warm at night. I have read other articles that were basically the same, but had no idea they would lose their foraging desire. Thank you for reading, Nikki. And that’s OK for you to keep your soft teddy bear to snuggle. LOL Just don’t feed the wild bears in the national parks!